One of the problems with the present Irish upswing is the curious case of the missing money. Economic growth (estimated at 7%) may be somewhat cosmetic (look here) but employment and consumption have been increasing at a brisk rate, too. Which is, also considering the upswing in house prices, remarkable as Irish households are deleveraging and rapidly so, while companies are not really borrowing, according to the Bank of Ireland. Total loans owed by non financial companies behave slightly erratic but are still lower than in 2012.This runs counter to ideas about balance sheet recessions: deleveraging should lead to less consumption and investment. So, where does all the money come from? Trade credits. See graph 1 (the flow of funds data from the Irish central bank show that this increase went on at least until the third quarter of 2016 and possibly even at a faster rate). Irish companies are accepting ‘promises to pay’ from their customers as a (legally binding) means of payment, therewith pulling themselves and the Irish economy out of the morass. In Yesterdays post I requoted a William Bragg quote from the seventh edition of Greg Mankiw’s famous economics textbook: “The important thing in science is not so much to obtain new facts as to discover new ways of thinking about them“. Hmmm… maybe new facts should also change our opinions and our thinking. 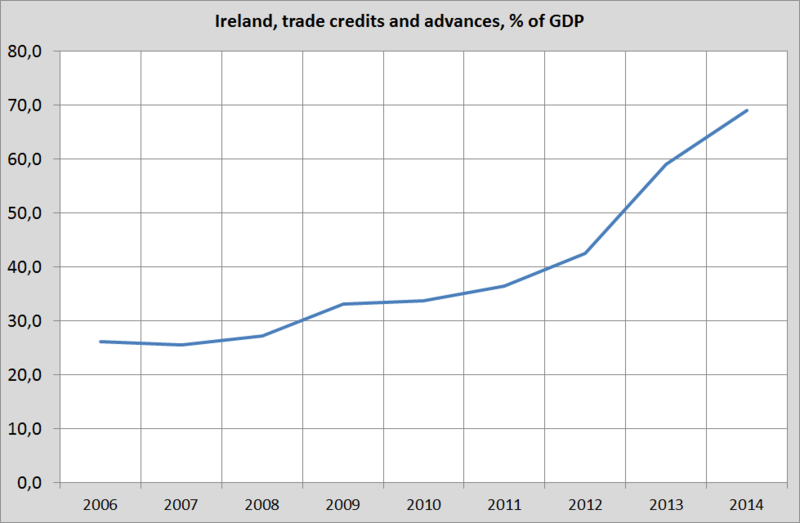 I’m a big fan of trade credits as a way to finance transactions – but this might well be too much of a good thing (the national accounts definition of trade credits can be found here; Eurostat differences between countries are too large to be credible but the Irish Eurostat data are consistent with the data from the Irish central bank and do explain the curious situation of rapid deleveraging while household consumption is growing with leaps and bounds). Price rigidities and unemployment Why Trump?